Asheville, NC — White-nose syndrome (WNS) has killed more than six million bats over the past decade. WNS is caused by the cold loving fungus Pseudogymnoascus destructans (Pd). Studies show that bats are vital species that eat enough insect pests to save the U.S. corn industry more than $1 billion a year in crop damage and pesticide costs, and more than $3 billion per year to all agricultural production including forests. Federal agencies, universities, private researchers, as well as state agencies and tribes are working together to help save bats affected by WNS. Susan Loeb weighs a tri-colored bat in Stumphouse Tunnel, a hibernaculum in South Carolina. Photo by Jonathan Brooks, Clemson University. “The goal of this project is to determine whether tri-colored bats that use winter roosts other than caves and mines are susceptible to WNS,” Loeb explained. 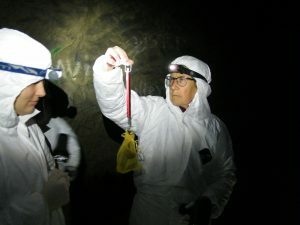 “We will use temperature-sensitive radio-transmitters and track tri-colored bats throughout the winter period in an area void of caves and mines to determine their roost sites and hibernation patterns. We want to see the vulnerability of tri-colored bats that hibernate in bridges and trees to WNS,” she said. Their project will be conducted on the Savannah River Site in New Ellenton, S.C. The information gained will allow managers and biologists to determine whether winter roost sites in trees and bridges provide an environment that is not amenable to the growth of Pd and WNS infection. If bats in these areas are not vulnerable to WNS, these sites will represent important refugia for this species. Of course if the opposite is found to be true and tri-colored bats are still vulnerable to WNS, these bats may decline as quickly as those that roost in caves and mines, resulting in a further threat to their survival. Either way, important information will be gathered that will assist managers in developing conservation and recovery strategies for this once common but now declining species.